Mfon (Arche) Archibong named 'Student of the Year' at the annual Health Education North Central and East London Awards. City academics also recognised in the 'Innovation in Healthcare Education and Training' category. A graduate of City University London's Health Visiting course, Mfon (Arche) Archibong, was named 'Student of the Year' at the annual Health Education North Central and East London Awards, last night. Mfon was praised for his work helping low income families to exchange their vouchers for Health Start vitamins by creating a public health initiative involving local pharmacists, children's centres, the healthy trainers' team and the public health department to ensure these vitamins were stocked in a local pharmacy. City students Tola Durowujo and Amanda Stell, were also Highly Commended. Judges described Tola as "an ambassador for the profession" and praised Amanda's "enthusiasm and commitment," to her work with vulnerable children. Academics from City were also recognised in the 'Innovation in Healthcare Education and Training' category, with Dr Jo Verhoeven (pictured, right) claiming the top prize for his innovative Eartrainer software package. Eartrainer, which Dr Verhoeven developed with learning technician Robert Davey, is a unique tool designed to assist speech and language therapy students develop effective transcription skills. The programme includes exercises such as; phonetic labelling, symbol drill, guided transcription and free transcription. City's Shareville project, which is led by Mental Health and Social Care lecturer Lorna Saunder and the Service User Group Advising on Research (SUGAR), led by Professor Alan Simpson, were both Highly Commended in the same category. 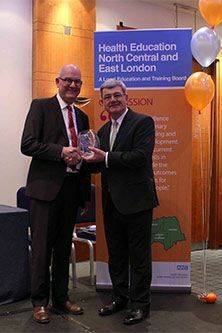 The Health Education North Central and East London quality awards were established to acknowledge and celebrate examples of excellence in multi-disciplinary education, training and workforce development across North Central and East London. Professor Stanton Newman, Dean of City's School of Health Sciences, said: "I am delighted that Jo and Lorna have been recognised for their innovative use of technology to enhance the quality of education we provide. "The School of Health Sciences places a create deal of emphasis on use of new techniques and tools and Jo and Lorna's work are shining examples of this. The Service User Group on Research success emphasises how well we are at integrating users into our research with the purpose of making research relevant to people who receive health care"
"I am also delighted that Mfon and Tola have been recognised for the impact they have made so early in their careers. Their hard work and commitment and innovation have changed the lives of so many in their communities and they are an inspiration to their peers."